Description: China has made rapid developments in space technologies and space activities in the last few years, however, it still lags behind in the legal arena. In order to provide guidelines for and promote further development of space activities, China should speed up its national space legislation process. In National Space Law in China, Yun Zhao offers a comprehensive study of national space laws, regulations and policies in China. 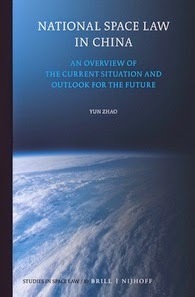 It contains rich information and materials of China’s space law and practice. As the first English monograph on national legislation on space law in China, this book shall contribute to the understanding of China’s current legal regime for space activities and future national space legislation.